Another off-topic post, but yesterday I took my little boy to the local airshow at Shoreham. Despite seeing and hearing planes roar and buzz overhead on their way to and from the show for the last 10 summers, I had never been, so it was great to get a chance to have a look up close and see the action. 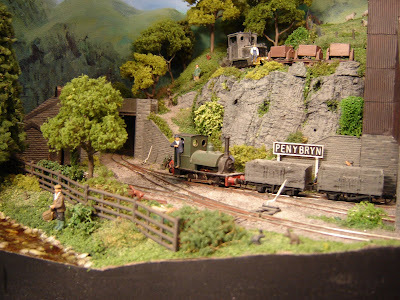 For those that are interested there are a selection of photo's below, the make a change to the usual model railway shows! But don't worry, Railway-related posts will resume shortly! There were other displays too, including acrobatics, wing-walking, parachutists, and some WWI bi- and tri-planes (replicas). A great day out, and worth a little sunburn! My boy loved it too, though he found the Typhoon a bit too noisy on full afterburner! (Amazing what that plane can do, but the picture's weren't great). These aeroplane enthusiasts know how to put on a show. A couple of poor camera-phone shots of Pen-Y-Bryn after the mice have gone. I've removed some details and people and vacuumed up the mouse-droppings and polystyrene, the remaining damage is not too bad. The orange flecks on the cliffs are where the cork-bark has been nibbled, as has the bark off some of the logs. The ballast has come away in places, and the grass and shrubbery could do with freshening up. On another note I have come accross a couple more Blogs of interest recently, links are in the BlogRoll! Earlier this week we noticed a funny smell in the garage - that's right, mice. So out came the traps, and this afternoon with the help of my father-in-law we did a spring-clean, checking every box and sweeping out. I guess it wasn't a surprise to find the mice had been at Pen-Y-Bryn Quarry, which was stored in the garage. The polystyrene forming the hills had been excavated (quarried?) and carried along the track all over the model, and small black droppings littered the hillside (in O gauge they might have passed for scale sheep droppings!). The little blighters had nibbled the rock-face (cork bark), and even tried some of the people and animals (tell-tale flashes of whitemetal! ), plus other people, animals, and details were strewn about, flattened by the giant rodents. I did take a picture on my phone but it didn't come out, so the one above shows how it looked before the damage! This evening I pulled off any loose details for safety and hoovered up the polystyrene and mouse droppings. I guess it could have been worse; the foamboard structure is intact, no wiring or track or buildings are damaged, it is just scenic damage. Some touching-up of paint, and sloshing some dilute PVA around with ballast and flock should not take too long, then putting the details back. But right now I'm not sure what to do, after all I still don't have anywhere better to store it; it is too large to go through the loft-hatch and since our second child arrived there is no space in the house. A 50cm cube is pretty large when you look at it. A close-up of the station, the porter and a solitary passenger await the next train. I had to take the platform roof off to get enough light on the platform! The noticeboard could do with some signs, the platform could use a few more trunks and luggage (but mustn't over-do-it, this isn't exactly Euston! ), also the yard could do with detailing - coal and goods. The wagon is a Dundas GVT open, at just over an inch long those Microtrains couplers are still unobtrusive. Tea break at the factory yard. The GVT tram runs on a Halling chassis, a superb runner. This loco would go so slow it could take 5 minutes to traverse the layout! "Lucy Ann" arrives with the evening train while the Peckett shunts the goods shed. I really must get some nameplates etched too! The coach is a Mikes Models Corris kit, I even put passengers in!